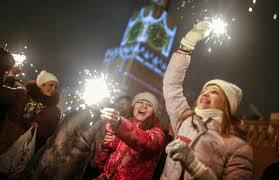 Most Russians celebrate New Year’s Eve with family and close friends. New year’s celebration in Russia comes from the celebration of Christmas. Big holiday in Russia is Christmas before Communist Party have banned the religious festivities. Russians celebrate the New Year as much as possible as Christmas, but exclude the religious aspect. Its compensation because forbidden to celebrate Christmas. Even after the collapse of the Soviet Union, the New Year remained celebrated in Russia and has become one of the most important traditions in Russia. Russians believe that the first guests who come on January 1 (especially unexpected guests) are male, then that year will be a good year. So what Symbols and Tradition of New Year in Russia? Read also Tradition of Christmas Celebration in Russia. Kremlin is a historic fortress in the center of Moscow built from brick in the 15th century. It is bordered by the river Moscow on the south, the Cathedral of Saint Basil and the red square in the east, and the Alexander Park in the west. The length of the wall is more than 2 km, height up to 19 m, width 3.5 – 6,5 m, width 27,5 ha. The Kremlin has 20 towers. The most famous of these is the Spasskaya Tower (67.3 m high) with a 6 m diameter center clock. There are old legacy like churches with Russian cemeteries burial places. There is also an army hall where there are various heritage items including horse-drawn carriages, crowns, clothing, jewelry and weapons belonging to the Czar. Kremlin used to be the residence of the Russian tsars, but now it is the place of the President’s office. Previously in the soviet union, religious practice was once banned. In the late 1920s, Russians stopped celebrating Christmas, at least officially. But in 1935, the New Year as winter holiday was replacing the Christmas celebrations. Without thinking, the Christmas tree became the official symbol of the New Year. Today, the tree symbolizes winter, while the star at its peak turns from the symbol of Bethlehem to the symbol of the Soviet Union, let alone the ruby ​​star already worn over the Kremlin. The Soviet government sought to promote a culture that was originally a family vacation into a public holiday. Soviet citizens attended national celebrations at cultural venues or public places. Meanwhile, the children gather at stadiums, kindergartens, even in military bases to follow ‘yolka’, ie concerts. They has costumed performances, participate in various competitions, and receive prizes. The New Year became the favorite holiday for the Soviet children. The ideological purpose at that time was inspiring the text of ‘yolka’. Its must reflect the achievements of the Soviet Union that can be understood by children. For example, the launch of Sputnik 1 in 1957 marked the ‘space period’ on the stage of the show. The storyline is always simple and clear. The antagonists try to prevent children from celebrating the New Year’s holiday. Then the good ones will come. So the situation will stabilize just before the clock touches midnight. The ‘Yolka’ held at the Kremlin Congress Palace, was the most coveted New Year’s party for Soviet children. The show attend by only the children with the best achievements. Also the children of important figures can attend that show. The show is believed to be the most colorful ‘yolka’ and presents the best gift for children. Children invited to this elite party will tell their classmates about the taste of candy and gifts they have received for a long time. Religion has been re-practiced in modern Russia. Beyond the fact that about 80 percent of Russians claim to embrace Orthodox Christianity, ‘yolka’ remains a secular celebration. Celebration of Orthodox Christmas is on January 7. While the show for children begins in late December, when Orthodox Christians should fast. Although which means “fasting” from all entertainment.